A small mod which i've been working on recently. It simply adds an custom pickup sounds when looting an item. 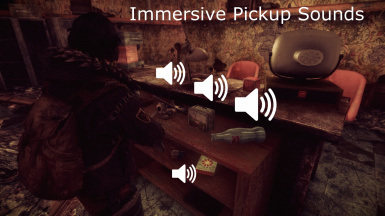 This mod adds custom pickup sounds when looting items in the wasteland. This mod adds custom pickup sounds to most commonly picked items such as purified water, scrap metal, skill books an so on. It also adds an custom equip sound to pulse and plasma grenades which really help "grenade hotkey" users. For FWE users, there's a great patch for this mod by TheMagician16. Patch link found from the comment section. Extract the "Data" folder and its contents to your Fallout directory.